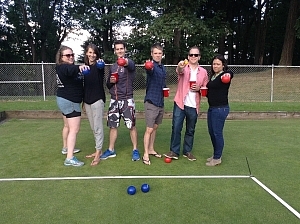 It was a fantastic evening for David Coe and Invasion of the Bocce Snatchers. Facing eminent defeat, Coe snatched away a victory in the final end of his team's match with Fuhgetabocce. His clutch rolling was the difference between victory and defeat.